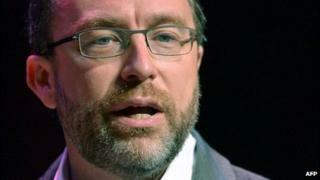 The boring university lecture is going to be the first major casualty of the rise in online learning in higher education, says Wikipedia founder Jimmy Wales. The custodian of the world's biggest online encyclopaedia says that unless universities respond to the rising tide of online courses new major players will emerge to displace them, in the way that Microsoft arrived from nowhere alongside the personal computer. "I was taking an advanced calculus class and my instructor was reputed to be a fabulous researcher, but he barely spoke English. He was a very boring and bad teacher and I was absolutely lost and in despair. "So I went to the campus tutoring centre and they had Betamax tapes of a professor who had won teaching awards. Basically I sat with those tapes and took class there. But I still had to go to the other one and sat there and wanted to kill myself. Deleted categories include "Permanent residents of hell" and "Guys who used to have long hair"
"I thought at that time, in the future, why wouldn't you have the most entertaining professor, the one with the proven track record of getting knowledge into people's heads? "We're still not quite there. In university you're still likely to be in a large lecture hall with a very boring professor, and everyone knows it's not working very well. It's not even the best use of that professor's time or the audience." Online courses provide such libraries of video lectures, supplemented with interactive information, that can be used at any time on a tablet computer or laptop. And Mr Wales suggests the future model of higher education will be to allow students to use recordings of lectures - and to use the teaching time to discuss and develop what students have been watching. "It seems much more effective and is the direction I think we're going to go." The sheer scale of the information and the volume of its consumption has no parallel in history. Wikipedia's latest internet traffic is running at more than 21 billion page impressions per month. But he says it remains uncertain whether universities will be ready to change. "There's a certain inertia in the system." "The really interesting challenge for big-brand universities is whether they are going to move into that space. If we thought of universities as normal businesses we would say, 'Will they be able to adapt to the PC revolution?' It's that kind of question. Will Harvard or MIT, Oxford or Cambridge, be able to adapt? Or will Microsoft come out of nowhere? "It's going to be really fascinating to see it unfold." In terms of technology in education, he says we should look at how it's being driven by interest in home schooling. "In the US, for younger children, the home schooling movement is huge. "There are a load of online educational resources, they're booming. Parents are looking for the best education for their kids, they realise these tools are working. There's a marketplace for it long before the traditional school is going to think about it." Mr Wales himself grew up in a small private school run by his mother and grandmother in Alabama. There were four other children in his grade. "It was like a one-room schoolhouse, the kind of place Abe Lincoln went to school," he says. "Education was our life, something incredibly valued by my family." An important part of Wikipedia's future focus, he says, is going to reach the modern world's version of isolated school houses in the developing world. In wealthier countries there might be the luxury of a debate about whether Wikipedia is better or worse than printed encyclopaedias. But Mr Wales wants to support languages in Africa where there have never been encyclopaedias in the first place. Wikipedia operates in 286 different languages, but the content is very unevenly spread. There are more than 4 million articles in English, while Xhosa, spoken by almost 8 million people in South Africa, only has 147 articles. "Our role in languages of the developing world is quite different from our role in English. "We've still got a long way to go. I'd say we've increasingly turned our focus to the languages of the developing world. It's really of great importance. Our goal is a free encyclopaedia for everyone in their own language." He rejects the idea that Wikipedia's instant knowledge represents some kind of dumbing down. It has long been accused of being the hidden hand in countless school and university assignments. But Mr Wales says it plays a vital democratic role in allowing ordinary people to become informed in a way that would never have been possible before. If there is a story in the news, people can find out the background for themselves. "We can see it in our traffic. There's a massive spike. "In some rose-coloured view of the past we all went home and read books about it. The truth is that we didn't. "It's remarkable that people now have the opportunity. It's not a Utopian state, but people have the possibility to do their own research." Mr Wales also defends what Wikipedia represents for free speech in countries with censorship and a lack of human rights. "The impact of the knowledge we bring is important, but what is much more deeply political is the concept of Wikipedia, that ordinary people should be able to participate in the grand human dialogue. "It's a very subversive idea in a society that is top-down and 'do as your masters tell you,'" he says. The online encyclopaedia is now 12 years old, launched in the same month as iTunes and when Greece adopted the euro. It has grown to 26 million articles and has more than 500 million individual users a month. Wikipedia's next development will be to make it easier for a wider variety of people to write and edit articles, with an editing tool that is more user-friendly. "For people who aren't computer geeks, it's intimidating. The user base of active editors tend to be computer-savvy. We want to diversify, so they can be geeks but not computer geeks." Of course, there's still a big unanswered question. How would the king of Wikipedia get on in a pub quiz? Would he have to illicitly check his smartphone under the table? "I've declined to go on a TV quiz show. There's no upside for me. Unless I get every single question right I'm going to be subject to mockery. Because I'm meant to be the encyclopaedia guy."